After I made my 4th of July pillows, I got excited about decorating the front porch and a few places around the house. Nothing crazy, just enough to celebrate this great country I live in. A trip to the dollar store and I was ready to go. I had some star decals left over from my pillow project, so I decided to attach them to some skewers. It was simple enough to do, just attach one decal to a skewer then attach the same size decal to the back so that they stick to each-other with the stick in between. I stuck these in the planter on the front door. 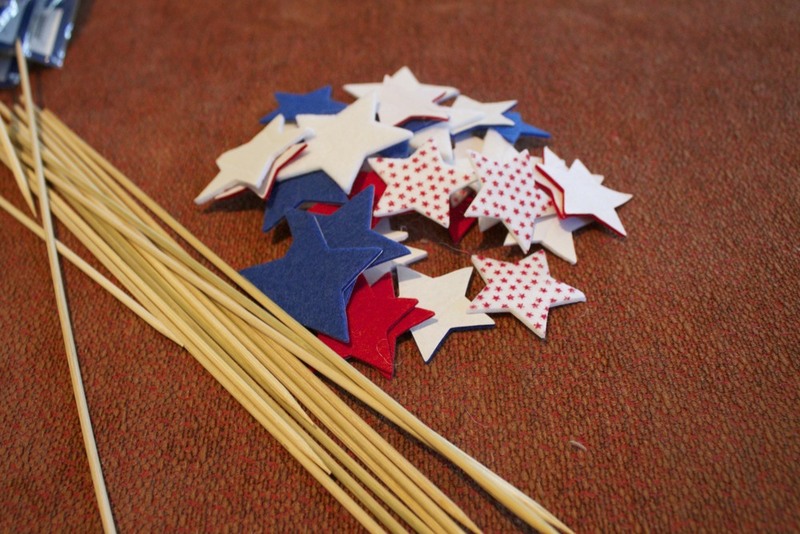 Next, I strung together some red, white and blue paper lanterns to hang instead of a flag. Pillows on the chairs and the front porch is done. Patriotic but not over the top. I like it. Next, the outdoor dining room got some sparkle with a garland and sprays instead of candles. I did all this for less than $15 (not including the pillows). Notice that I didn't go crazy with red, white and blue. I used orange flowers in the breakfast room and a burlap runner on the dining table. That makes it a lot more subtle and doesn't look like theme decor which is not my style. Posted in It's The Season and tagged with 4th of July, decor, seasonal decorating. July 1, 2013 by Lynn Adams.